A photo taken yesterday shows the flood situation at Rumah Penghulu Surang, Jalan Nanga Tajam Oya. Gira (left) visits a flood evacuation centre in Selangau. SIBU: The flood situation in Selangau is the worst in 15 years, with over 1,000 people displaced from their homes, says Tamin assemblyman Christopher Gira. He said the hardest hit area are Nanga Tajam, Batang Mukah and Ulu Arip, with longhouses severely inundated and road access cut off. “I had just visited these areas yesterday (Wednesday). In Nanga Tajam, Batang Mukah and Ulu Arip – the longhouses there are badly affected and connectivity has been cut off. 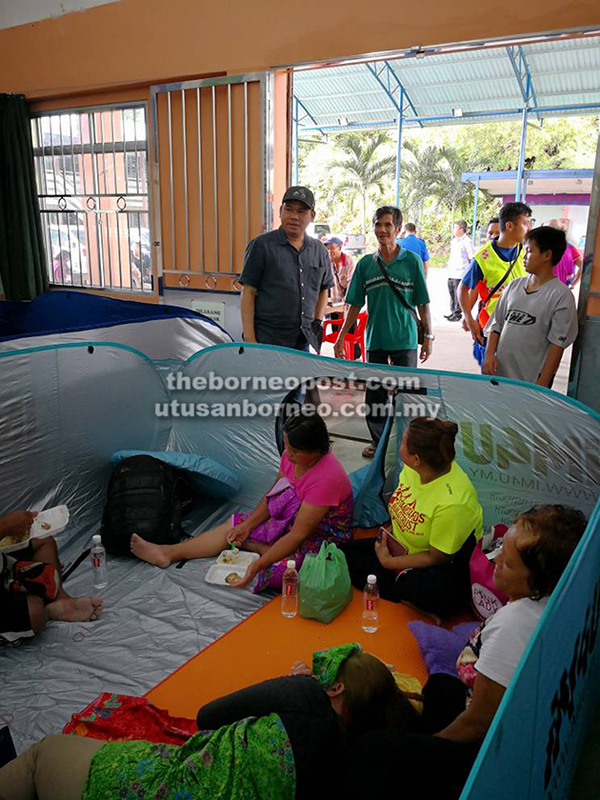 So far, there are nine evacuation centres there (Selangau), including one in SJK Tong Ah where there are about 200 people,” he told reporters when met at Sibu Airport yesterday. Gira said the Fire and Rescue Department (Bomba), Civil Defence Force (APM) as well as the army are giving assistance. He had discussed with First Infantry Division Commander Major General Datuk Stephen Mundaw on the use of a helicopter to deliver rations and also to help in the evacuation of victims. “So far, there is no problem of supplying rations to those affected by floods.